H.G. Wells’ The War of the Worlds was introduced to me at the height of my science fiction phase of my youth and despite a pretty awful cover I devoured the book and have loved it ever since. 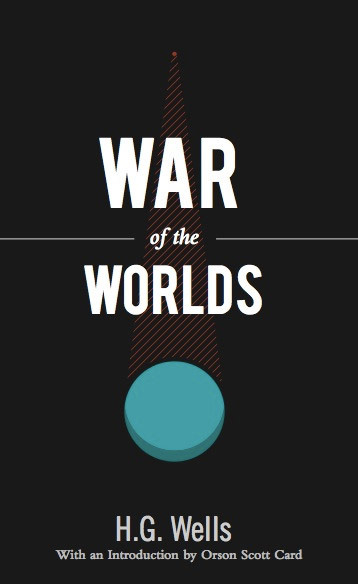 In essence the original Martian invasion story, The War of the Worlds holds a special place in the hearts of literary geeks everywhere. It wasn’t until years later that I heard of and subsequently heard Orson Welles’ theatrical radio production of The War of the Worlds broadcast on October 30th 1938. Glued to their radio-sets families across the nation panicked as Welles sat in a studio with a few other actors and convinced them that the end was near. This occurrence adds further legitimacy to the power of the written and spoken word and the great importance of the original work by H.G. Wells. As I was working on this cover I listened to the RadioLab episode which features the original radio broadcastfrom 1938.